Candidates for the Fulwell ward, clockwise, from top left, Malcolm John Bond (Liberal Democrat), Christopher Thomas Harding (Labour), Steven Peter Murray (Green Party) and George Edward Howe (Conservatives). 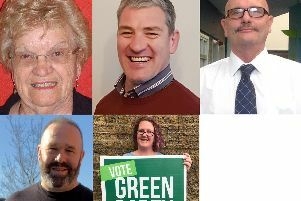 This year’s local elections are just around the corner, and we are turning the spotlight on all Sunderland's candidates in the run-up to polling day on May 3. Each one will be given the opportunity to tell readers why they are standing and why people should vote for them. The local elections are on May 3. I was born and raised in Fulwell and still live in the ward. I am retired and volunteer with Age UK, running a lunch club for the elderly in the area. I take a great interest in the needs and issues of Fulwell and have the time and energy to work hard to ensure that our council tax is spent wisely for everyone’s benefit. One of my particular concerns is our beautiful seafront. I would like to see it improved for use by the public and to attract tourists to the area by providing more facilities for children and families. I have lived in Fulwell all my life and understand the issues in our community. If elected, my top priority will be dog fouling and litter. I have participated in litter-picks around Sea Road and the seafront and will fight for more resources to tackle this problem. I have been involved in community activities. I am secretary of the Fulwell Community Library and was part of the group who fought to save this service. I was also involved in the petition which led to the parking management scheme for the streets around the hospital and the Metro station. The voters of Fulwell ward have shown their belief in me by giving me their trust to represent them for the past 22 years. I am proud to be given another opportunity to continue to serve them. In order to continue representing their individual and collective views and issues I am asking them to re-new their support by voting for me in this forthcoming local election. The people of Fulwell deserve to have a voice in how this city progresses away from Labour’s inept handling of the seafront, the Vaux site and children’s services, to name just a few examples. I will be standing as Liberal Candidate for Fulwell, which includes Seaburn and South Bents, where I currently live. My family and I have lived here since 1982. My professional life was in dentistry, but I am now retired. Over the last months I have engaged with local residents, seafront visitors and local businesses to discuss how best we can preserve our local environment. Many are concerned about the over-development of the coastline in Seaburn and loss of adjoining green space. My priority is to preserve our area for both residents and visitors.